The earliest known Egyptian pyramids are found at Saqqara, northwest of Memphis. The earliest among these is the Pyramid of Djoser, which was built c. 2630–2610 BC during the Third Dynasty. This pyramid and its surrounding complex were designed by the architect Imhotep, and are generally considered to be the world's oldest monumental structures constructed of dressed masonry. By the time of the Early Dynastic Period, those with sufficient means were buried in bench-like structures known as mastabas. The second historically-documented Egyptian pyramid is attributed to the architect Imhotep, who planned what Egyptologists believe to be a tomb for the pharaoh Djoser. Imhotep is credited with being the first to conceive the notion of stacking mastabas on top of each other, creating an edifice composed of a number of "steps" that decreased in size towards its apex. The result was the Pyramid of Djoser, which was designed to serve as a gigantic stairway by which the soul of the deceased pharaoh could ascend to the heavens. Such was the importance of Imhotep's achievement that he was deified by later Egyptians. The most prolific pyramid-building phase coincided with the greatest degree of absolutist rule. It was during this time of the Old Kingdom of Egypt that the most famous pyramids, the Giza pyramid complex, were built. Over time, as authority became less centralized, the ability and willingness to harness the resources required for construction on a massive scale decreased, and later pyramids were smaller, less well-built and often hastily constructed. Long after the end of Egypt's own pyramid-building period, a burst of pyramid-building occurred in what is present-day Sudan, after much of Egypt came under the rule of the Kingdom of Kush, which was then based at Napata. While Napatan rule was brief, ending in 661 BC, Egyptian culture made an indelible impression. The Meroitic period of Kushite history, when the kingdom was centered on Meroë, (approximately in the period between 300 BCE and 300 CE), saw a full-blown pyramid-building revival, which saw more than two hundred Egyptian-inspired indigenous royal pyramid-tombs constructed in the vicinity of the kingdom's capital cities. Al-Aziz Uthman (1171–1198) tried to destroy the Giza pyramid complex. He gave up after damaging the Pyramid of Menkaure because the task proved too huge. Diagram of the interior structures of the Great Pyramid. The inner line indicates the pyramid's present profile, the outer line indicates the original profile. The shape of Egyptian pyramids is thought to represent the primordial mound from which the Egyptians believed the earth was created. The shape of a pyramid is thought to be representative of the descending rays of the sun, and most pyramids were faced with polished, highly reflective white limestone, in order to give them a brilliant appearance when viewed from a distance. Pyramids were often also named in ways that referred to solar luminescence. For example, the formal name of the Bent Pyramid at Dahshur was The Southern Shining Pyramid, and that of Senwosret at el-Lahun was Senwosret is Shining. While it is generally agreed that pyramids were burial monuments, there is continued disagreement on the particular theological principles that might have given rise to them. One suggestion is that they were designed as a type of "resurrection machine." The Egyptians believed the dark area of the night sky around which the stars appear to revolve was the physical gateway into the heavens. One of the narrow shafts that extend from the main burial chamber through the entire body of the Great Pyramid points directly towards the center of this part of the sky. This suggests the pyramid may have been designed to serve as a means to magically launch the deceased pharaoh's soul directly into the abode of the gods. All Egyptian pyramids were built on the west bank of the Nile, which, as the site of the setting sun, was associated with the realm of the dead in Egyptian mythology. In 1842, Karl Richard Lepsius produced the first modern list of pyramids – now known as the Lepsius list of pyramids – in which he counted 67. A great many more have since been discovered. As of November 2008, 118 Egyptian pyramids have been identified. 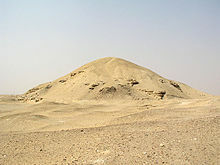 The location of Pyramid 29, which Lepsius called the "Headless Pyramid", was lost for a second time when the structure was buried by desert sands after Lepsius's survey. It was found again only during an archaeological dig conducted in 2008. Many pyramids are in a poor state of preservation or buried by desert sands. If visible at all, they may appear as little more than mounds of rubble. As a consequence, archaeologists are continuing to identify and study previously unknown pyramid structures. 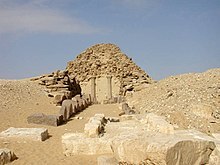 The most recent pyramid to be discovered was that of Sesheshet at Saqqara, mother of the Sixth Dynasty pharaoh Teti, announced on 11 November 2008. All of Egypt's pyramids, except the small Third Dynasty pyramid of Zawyet el-Amwat (or Zawyet el-Mayitin), are sited on the west bank of the Nile, and most are grouped together in a number of pyramid fields. The most important of these are listed geographically, from north to south, below. Abu Rawash is the site of Egypt's most northerly pyramid (other than the ruins of Lepsius pyramid number one)— the mostly ruined Pyramid of Djedefre, son and successor of Khufu. Originally it was thought that this pyramid had never been completed, but the current archaeological consensus is that not only was it completed, but that it was originally about the same size as the Pyramid of Menkaure, which would have placed it among the half-dozen or so largest pyramids in Egypt. Its location adjacent to a major crossroads made it an easy source of stone. Quarrying, which began in Roman times, has left little apart from about 15 courses of stone superimposed upon the natural hillock that formed part of the pyramid's core. A small adjacent satellite pyramid is in a better state of preservation. Giza is the location of the Pyramid of Khufu (also known as the "Great Pyramid" and the "Pyramid of Cheops"); the somewhat smaller Pyramid of Khafre (or Chephren); the relatively modest-sized Pyramid of Menkaure (or Mykerinus), along with a number of smaller satellite edifices known as "Queen's pyramids"; and the Great Sphinx of Giza. Of the three, only Khafre's pyramid retains part of its original polished limestone casing, near its apex. This pyramid appears larger than the adjacent Khufu pyramid by virtue of its more elevated location, and the steeper angle of inclination of its construction – it is, in fact, smaller in both height and volume. The Giza pyramid complex has been a popular tourist destination since antiquity and was popularized in Hellenistic times when the Great Pyramid was listed by Antipater of Sidon as one of the Seven Wonders of the Ancient World. Today it is the only one of those wonders still in existence. This site, halfway between Giza and Abusir, is the location for two unfinished Old Kingdom pyramids. The northern structure's owner is believed to be pharaoh Nebka, while the southern structure, known as the Layer Pyramid, may be attributable to the Third Dynasty pharaoh Khaba, a close successor of Sekhemkhet. If this attribution is correct, Khaba's short reign could explain the seemingly unfinished state of this step pyramid. Today it stands around 17 m (56 ft) high; had it been completed, it is likely to have exceeded 40 m (130 ft). There are a total of fourteen pyramids at this site, which served as the main royal necropolis during the Fifth Dynasty. The quality of construction of the Abusir pyramids is inferior to those of the Fourth Dynasty – perhaps signaling a decrease in royal power or a less vibrant economy. They are smaller than their predecessors, and are built of low-quality local limestone. The three major pyramids are those of Niuserre, which is also the best preserved, Neferirkare Kakai and Sahure. The site is also home to the incomplete Pyramid of Neferefre. Most of the major pyramids at Abusir were built using similar construction techniques, comprising a rubble core surrounded by steps of mud bricks with a limestone outer casing. The largest of these Fifth Dynasty pyramids, the Pyramid of Neferirkare Kakai, is believed to have been built originally as a step pyramid some 70 m (230 ft) high and then later transformed into a "true" pyramid by having its steps filled in with loose masonry. Major pyramids located here include the Pyramid of Djoser – generally identified as the world's oldest substantial monumental structure to be built of dressed stone – the Pyramid of Userkaf, the Pyramid of Teti and the Pyramid of Merikare, dating to the First Intermediate Period of Egypt. Also at Saqqara is the Pyramid of Unas, which retains a pyramid causeway that is one of the best-preserved in Egypt. Together with the pyramid of Userkaf, this pyramid was the subject of one of the earliest known restoration attempts, conducted by Khaemweset, a son of Ramesses II. Saqqara is also the location of the incomplete step pyramid of Djoser's successor Sekhemkhet, known as the Buried Pyramid. Archaeologists believe that had this pyramid been completed, it would have been larger than Djoser's. South of the main pyramid field at Saqqara is a second collection of later, smaller pyramids, including those of Pepi I, Djedkare Isesi, Merenre, Pepi II and Ibi. Most of these are in a poor state of preservation. The Fourth Dynasty pharaoh Shepseskaf either did not share an interest in, or have the capacity to undertake pyramid construction like his predecessors. His tomb, which is also sited at south Saqqara, was instead built as an unusually large mastaba and offering temple complex. It is commonly known as the Mastabat al-Fir’aun. A previously unknown pyramid was discovered at north Saqqara in late 2008. Believed to be the tomb of Teti's mother, it currently stands approximately 5 m (16 ft) high, although the original height was closer to 14 m (46 ft). This area is arguably the most important pyramid field in Egypt outside Giza and Saqqara, although until 1996 the site was inaccessible due to its location within a military base and was relatively unknown outside archaeological circles. The southern Pyramid of Sneferu, commonly known as the Bent Pyramid, is believed to be the first Egyptian pyramid intended by its builders to be a "true" smooth-sided pyramid from the outset; the earlier pyramid at Meidum had smooth sides in its finished state – but it was conceived and built as a step pyramid, before having its steps filled in and concealed beneath a smooth outer casing of dressed stone. As a true smooth-sided structure, the Bent Pyramid was only a partial success – albeit a unique, visually imposing one; it is also the only major Egyptian pyramid to retain a significant proportion of its original smooth outer limestone casing intact. As such it serves as the best contemporary example of how the ancient Egyptians intended their pyramids to look. Several kilometres to the north of the Bent Pyramid is the last – and most successful – of the three pyramids constructed during the reign of Sneferu; the Red Pyramid is the world's first successfully completed smooth-sided pyramid. The structure is also the third largest pyramid in Egypt – after the pyramids of Khufu and Khafra at Giza. Also at Dahshur is one of two pyramids built by Amenemhat III, known as the Black Pyramid, as well as a number of small, mostly ruined subsidiary pyramids. Located to the south of Dahshur, several mudbrick pyramids were built in this area in the late Middle Kingdom, perhaps for Amenemhat IV and Sobekneferu. Two major pyramids are known to have been built at Lisht – those of Amenemhat I and his son, Senusret I. The latter is surrounded by the ruins of ten smaller subsidiary pyramids. 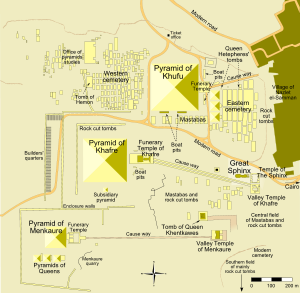 One of these subsidiary pyramids is known to be that of Amenemhat's cousin, Khaba II. The site which is in the vicinity of the oasis of the Faiyum, midway between Dahshur and Meidum, and about 100 kilometres south of Cairo, is believed to be in the vicinity of the ancient city of Itjtawy (the precise location of which remains unknown), which served as the capital of Egypt during the Twelfth Dynasty. 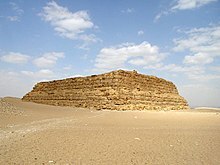 The pyramid at Meidum is one of three constructed during the reign of Sneferu, and is believed by some to have been started by that pharaoh's father and predecessor, Huni. However, that attribution is uncertain, as no record of Huni's name has been found at the site. 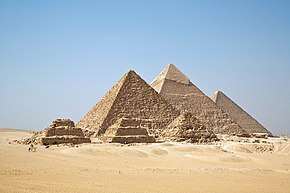 It was constructed as a step pyramid, and then later converted into the first "true" smooth-sided pyramid when the steps were filled in, and an outer casing added. The pyramid suffered several catastrophic collapses in ancient and medieval times; medieval Arab writers described it as having seven steps – although today only the three uppermost of these remain, giving the structure its odd, tower-like appearance. The hill on which the pyramid is situated is not a natural landscape feature – it is the small mountain of debris created when the lower courses and outer casing of the pyramid gave way. Amenemhat III was the last powerful ruler of the Twelfth Dynasty, and the pyramid he built at Hawara, near the Faiyum, is believed to post-date the so-called "Black Pyramid" built by the same ruler at Dahshur. It is the Hawara pyramid that is believed to have been Amenemhet's final resting place. The Pyramid of Senusret II. The pyramid's natural limestone core is clearly visible as the yellow stratum at its base. The pyramid of Senusret II at el-Lahun is the southernmost royal-tomb pyramid structure in Egypt. Its builders reduced the amount of work necessary to construct it by ingeniously using as its foundation and core a 12-meter-high natural limestone hill. Piye, the king of Kush who became the first ruler of the Twenty-fifth Dynasty of Egypt, built a pyramid at El-Kurru. He was the first Egyptian pharaoh to be buried in a pyramid in centuries. Taharqa, a Kushite ruler of the Twenty-fifth Dynasty, built his pyramid at Nuri. It was the largest in the area (North Sudan). Drawing showing transportation of a colossus. The water poured in the path of the sledge, long dismissed by Egyptologists as ritual, but now confirmed as feasible, served to increase the stiffness of the sand, and likely reduced by 50% the force needed to move the statue. The following table lays out the chronology of the construction of most of the major pyramids mentioned here. Each pyramid is identified through the pharaoh who ordered it built, his approximate reign, and its location. *Would have been 91.65 meters (301 feet) or 175 Egyptian Royal cubits. Constructing the pyramids involved moving huge quantities of stone. Papyri discovered at the Egyptian desert near the Red Sea, in 2013 by archaeologist Pierre Tallet, revealed the journal of Merer, an official of Egypt involved in transporting limestone along the Nile River. These papyri reveal processes in the building of the Great Pyramid at Giza, the tomb of the Pharaoh Khufu, just outside modern Cairo. Rather than overland transport of the limestone used in building the pyramid, there is evidence that limestone blocks were transported along the Nile River, in the journal of Merer, preserved remnants of ancient canals, and transport boats discovered. It is possible that quarried blocks were then transported to the construction site by wooden sleds, with sand in front of the sled wetted to reduce friction. Droplets of water created bridges between the grains of sand, helping them stick together. ^ Slackman, Michael (17 November 2008). "In the Shadow of a Long Past, Patiently Awaiting the Future". The New York Times. Retrieved 1 May 2010. ^ Mark Lehner (2008). The Complete Pyramids: Solving the Ancient Mysteries. p. 34. Thames & Hudson. 25 March 2008. ISBN 978-0-500-28547-3. ^ a b "Egypt says has found pyramid built for ancient queen". Reuters. 11 November 2008. Retrieved 2 November 2017. The pyramid, which Hawass said was the 118th found in Egypt, was uncovered near the world's oldest pyramid at Saqqara, a burial ground for the rulers of ancient Egypt. ^ a b Slackman, Michael (16 November 2007). "In the Shadow of a Long Past, Patiently Awaiting the Future". New York Times. Retrieved 17 November 2008. Deep below the Egyptian desert, archaeologists have found evidence of yet another pyramid, this one constructed 4,300 years ago to store the remains of a pharaoh’s mother. That makes 138 pyramids discovered here so far, and officials say they expect to find more. ^ Gardner, Helen (1980) . De La Croix, Horst; Tansey, Richard G. (eds.). Art through the Ages (7th ed.). New York: Harcourt Brave Jovanovitch. p. 68. ISBN 0-15-503758-7. ^ Watkin, David (2005). A History of Western Architecture (4th ed.). Laurence King Publishing. p. 14. ISBN 978-1-85669-459-9. "The Great Pyramid...is still one of the largest structures ever raised by man, its plan twice the size of St. Peter's in Rome"
^ "Early Dynastic burial customs". Digitalegypt.ucl.ac.uk. Retrieved 16 November 2012. ^ Quirke, Stephen (2001). The Cult of Ra: Sun Worship in Ancient Egypt. Thames & Hudson, pp. 118–120. ^ a b Wilkinson, Toby (2004). "Before the Pyramids". Egypt at its Origins. Studies in Memory of Barbara Adams Proceedings of the International Conference "Origin of the State. Predynastic and Early Dynastic Egypt", Krakow, 28th August - 1st September 2002. Peeters. p. 1142. ISBN 978-90-429-1469-8. Retrieved 18 June 2015. A final echo of earlier practices is seen in the domain established by Djoser to supply his mortuary cult. He called it Hr-sb3-/mti-pt, “Horus, the foremost star in the sky”. We could not wish for a clearer statement of the belief underlying the Step Pyramid: that it was a resurrection machine designed to propel its royal owner, Horus, to the pre-eminent place among the undying stars. ^ "Discovery Channel Nederland". Discoverychannel.co.uk. Archived from the original on 5 December 2004. Retrieved 16 November 2012. ^ Kratovac, Katarina (5 June 2008). "Egypt uncovers 'missing' pyramid of a pharaoh". Yahoo News. Associated Press. Archived from the original on 9 June 2008. Retrieved 6 June 2008. ^ "New Pyramid Found in Egypt: 4,300-Year-Old Queen's Tomb". News.nationalgeographic.com. 28 October 2010. Retrieved 16 November 2012. ^ Terrence McCoy (2 May 2014). "The surprisingly simple way Egyptians moved massive pyramid stones without modern technology". The Washington Post. ^ Stille, Alexander. "The World's Oldest Papyrus and What It Can Tell Us About the Great Pyramids". Smithsonian Magazine. Retrieved 26 June 2018. ^ Holloway, April. "Archaeologists Announce that New Discoveries Solve Mystery of How the Great Pyramid Was Built". Ancient Origins. Retrieved 26 June 2018. ^ "Solved! How Ancient Egyptians Moved Massive Pyramid Stones". Live Science. Retrieved 26 February 2018. 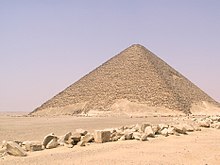 Wikimedia Commons has media related to Pyramids of Egypt. The Pyramids of Egypt – The meaning and construction of the Egyptian pyramids by Egyptologist Professor Nabil S welim. Ancient Egypt – History & Chronology – A site detailing the major pyramid sites of ancient Egypt and Nubia (Sudan).